A regular event at the Fête des Crus is the tasting of old vintages, which needs to be booked in advance but the event is open to everybody with a ticket. The aim of the tasting is to show off the aging potential and development of the Beaujolais Cru wines and entice people to age their wines a little. 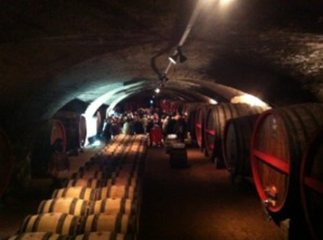 The tasting took place in cellars of Chateau de la Chaize and we got to taste in between the large barrels by candle light. We tasted 20 wines starting with the youngest one – a wine from 2006 – and ending with the oldest – the 1976 vintage. Just over half of the wines came from Brouilly and the Cote de Brouilly and it was really interesting to see the evolution of the different vintages in these Crus but I also enjoyed the opportunity to compare the aging differences of the same vintage in different Crus. My favourite was Domaine Chevalier-Métrat 1996 (Morgon), which was complex and elegant with still lots of fruit and freshness. I also like the Domaine du Pressoir Fleuri 1999 (Chirouble) and the Chateau du Prieuré Cuvée Raconat 1989 – both had an almost velvet texture, good intensity and a long and fresh finish – which I found pretty impressive for these older wines. (…) Besides the few faulty examples I was amazed at the quality and aging potentials of these Beaujolais Crus and feel that they were equally elegant and graceful in age as their more pricey Burgundian cousins! This entry was posted in Dégustations. Bookmark the permalink. ©	Copyright Château du Prieuré, tous droits réservés.